Looking for effective DA: Inquisition rogue builds? You’ve come to the right place. 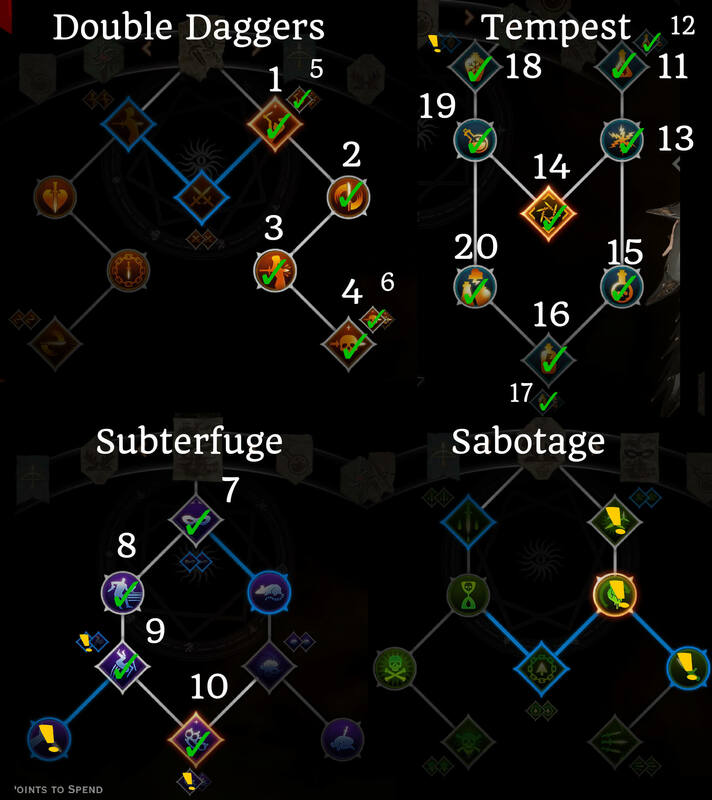 All of these builds have been tested & played extensively on Nightmare difficulty, and come with explanations on how to use the build, and which points to take as you level up. Play as the deadly Assassin, the versatile Tempest, or the team-oriented Artificer. The Dual Wield Assassin rogue is a classic whatever Dragon Age game you’re playing. High damage, mobility and use of stealth makes this build both fun to play and viable on all difficulties. With the recent changes to Shadow Strike, this build is now even stronger than before. 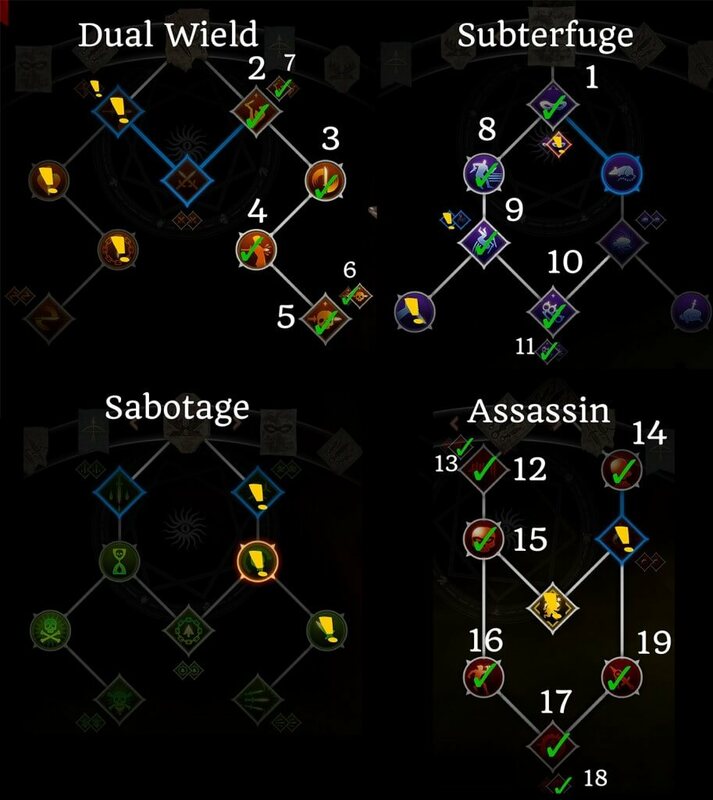 Some notes on skills: Once you’ve unlocked the basic build, you have several options. If you find that you’re always low on stamina, you can go down into sabotage and pick up the Looked Like it Hurt passive. If you have the Trespasser DLC, you can also unlock the Clinging Shadows upgrade for Stealth which will keep you safe for a few seconds after using abilities out of stealth. If you’re looking for more damage, you can pick up the two armor-reduction passives – Ambush in Subterfuge, and Cheap Shot in Sabotage, as well as the Hidden Step upgrade to make Evade do damage. Finally, can also further boost your overall damage by picking up the two passives on the left side of the Dual Wield tree – Bloodied Prey and Unforgiving Chain. 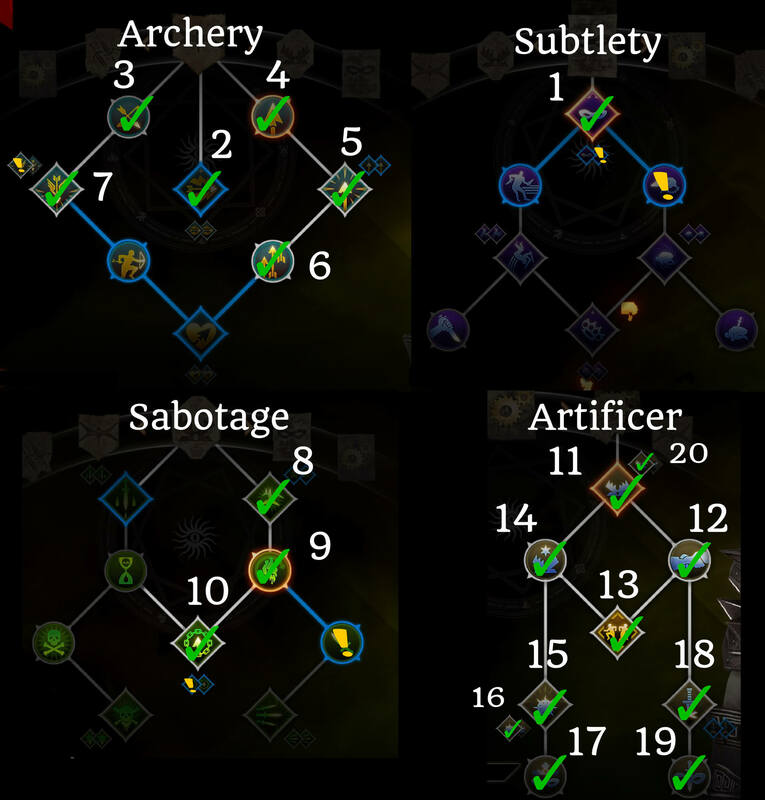 For your Focus skill, use either Mark of the Rift or Cloak of Shadows, depending on whether you’re using the build on your Inquisitor or not. In my experience this is one of the highest damage builds for rogues, and is also very fun to play thanks to Tempest Flasks. 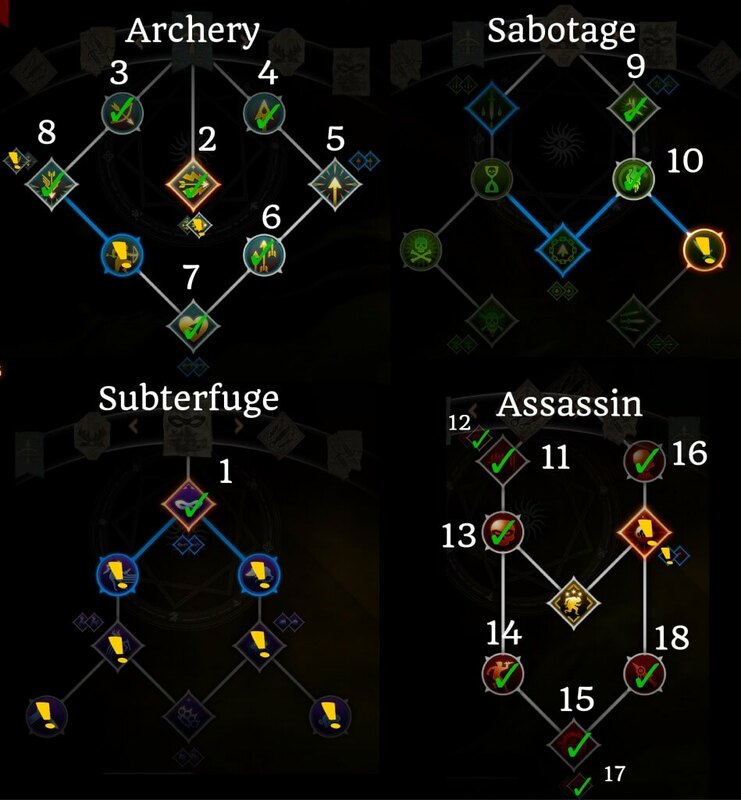 With the recent changes to DA: I’s skills, I’ve updated this build to include Shadow Strike for a more well-rounded experience. This is a barebones, early game (level 1-11~) rogue archer build meant to give you a solid archery base. We’re avoiding Leaping Shot since it doesn’t really shine until you unlock one of the rogue specializations. Note that you should only take the Long Shot upgrade if you have the new Trespasser version (Eagle Eye), otherwise skip it. Meanwhile for the Poisoned Weapons upgrade, you can try out either skill upgrade; the new Leeching Poison upgrade may be useful if you take damage frequently. This is a mid to late game build which slightly modifies the basic archer build, in addition to taking the Tempest specialization skills. 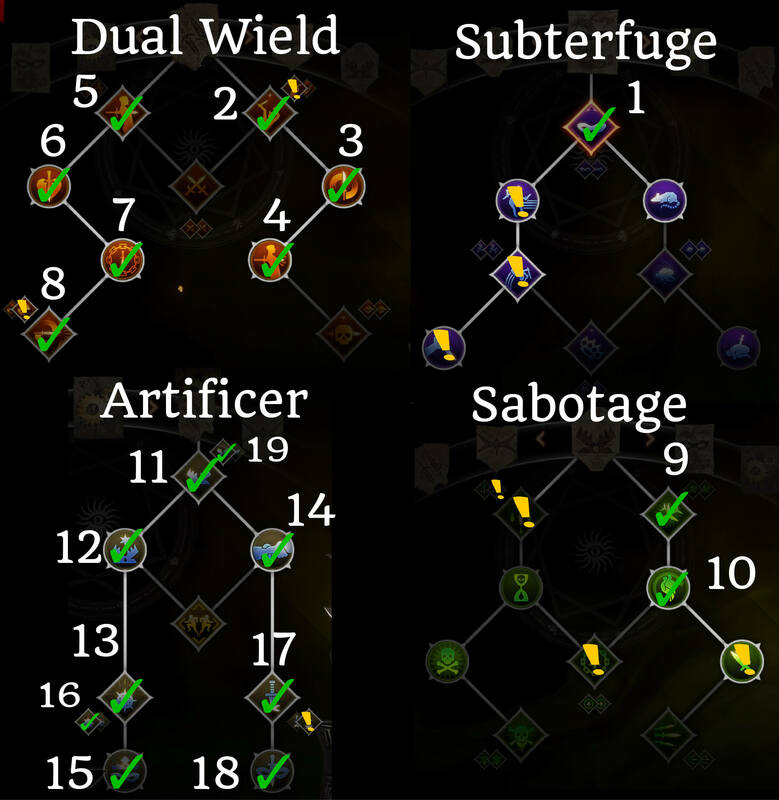 There are two key mechanics for this build: using your flasks back to back to maximize the bonuses you get from your Tempest passives, and using Hook & Tackle along with Leaping Shot and Flask of Fire for a powerful combo. To execute the Leaping Shot combo you hook in, activate fire flask (Unquenchable Flames upgrade), and then use Leaping Shot four times to cause massive damage to your target. This combo is especially effective against large targets (bosses and dragons), because your 12 attacks from leaping shot are less likely to miss. Note: If you have the Trespasser DLC, make sure to pick up the Thunderstruck upgrade for Lightning Flask. You can also try out the new Hook & Tackle upgrade (No Escape) – it is a big buggy at the moment, but in some cases it can greatly increase the accuracy of your Leaping shot combo on smaller enemies. The Artificer Archer offers a unique playstyle that is somewhere between a melee and a ranged rogue because you will always have to move around to make optimal use of your skills. Like the melee version of this build, the archer relies on the interaction of “Opportunity Knocks” and “Looked Like it Hurt” passives with other skills. Opportunity Knocks reduces your cooldown times whenever you or an ally crits, while Looked Like it Hurt refunds stamina whenever you crit. Coupled with high critical strike chance and skills like Leaping Shot, this allows you to reduce your cooldown times very quickly. In addition, the Artificer provides 3 great passives for the entire party – 5% extra crit chance, 10% damage, and 10% longer status effect durations. Note: Late game you can drop either Long Shot or Explosive Shot. By that point your cooldowns will reset so quickly that you’ll only really have time to use Spike Trap, Elemental Mines, and Leaping Shot. Although Artificer is usually seen as a ranged specialization, it actually works really well as melee. The core mechanic of the Artificer doesn’t really change – you’re still relying on the combination of the Opportunity Knocks and Looked Like It Hurt passives to quickly regenerate stamina and reduce cooldowns whenever you crit. With the changes to Spike Trap and Spinning Blades as well as the introduction of the Trespasser DLC skill toggles, this build now even more powerful than before. We’re taking Spinning Blades instead of Deathblow for this build; there’s 2 reasons for this. One, Spinning Blades has multiple attacks, which means you can crit more often and thus reduce your cooldown times faster. Two, Spinning Blades now also spreads debuffs from your target to surrounding enemies, which works really well together with your mines and other party members’ effects like freeze or burn. In addition to good damage, the Artificer provides powerful passives for the entire party – 5% extra crit chance, 10% damage, and 10% longer status effect durations. With proper gear, you will be critting so often that you may not have time to use anything other than Spike Trap and Elemental Mines, since they will come off cooldown really quickly. If you have the Trespasser DLC, be sure to pick up the new “One-Shot” Elemental Mines upgrade as it is very, very strong. This build has a lot of skills, but only has room for 8. 6 Core skills that you should always use are the following: Spike Trap, Elemental Mines, Spinning Blades, Stealth, Twin Fangs, and a mobility skill (either Hook & Tackle or Evade). The other 2 skills are up to you. For example if you’re playing this build on your Inquisitor, one of those can be Mark of the Rift. You can also use Flank Attack, Fallback Plan, and Poison Weapons. This build benefits a LOT from critical chance. More critical chance means you reduce your cooldowns/get stamina back more often. Consider crafting gear with that has either cunning or + critical strike chance on it, and be on the lookout for unique items like the Superb Amulet of Cunning. The cool thing about this build is that it seems like Bioware patched the bug that prevented the passive skill “Knife in the Shadows” from working with archer skills. This passive skill makes your first attack out of stealth auto crit, which is VERY strong when coupled with either Full Draw (800% + 800% bonus damage if enemy at full health) or Long Shot. Note: If your party is low on CC, you can take Knockout Bomb and use it instead of Explosive Shot. Also if you have the Trespasser DLC, make sure to pick up the Shot From the Shadows upgrade for Leaping Shot and the Eagle Eye upgrade for Long Shot after completing the core build. For your final skill, you can either take Cloak of Shadows (if you’re using this build on Cole) or Mark of the Rift if on your Inquisitor.